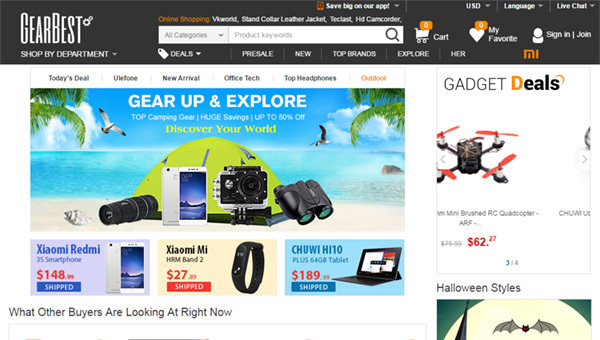 Gearbest - is a Chinese online shop, which was founded in 2014. The main direction of trade is a variety of electronics - cables and memory cards for smartphones, tablets and quadcopters. The site offers the customers a huge variety of goods. Apart from electronics, there you can buy clothes, bags, accessories, household goods, cars, sporting goods, toys, etc. Gearbest gives money back guarantee for 45 days in case your product is out of order. Moreover, there is a one-year warranty for repair of damaged items. The shop has several warehouses in USA, Europe, Russia and China. This significantly reduces the time of orders delivery, as these goods are in close proximity to customers. Furthermore, thus you can reduce load and time to prepare the order for shipment. However, the number of products and their choice in storage can sometimes be limited. You can learn more about the list of products available at warehouses on Gearbest website. Please note that you should choose a product when buying it from sections of the local warehouses. The shop has an excellent and fast customer support service that is available in English. The shop consultants will help you solve any problem. Shipping is possible by ordinary mail (free), and express delivery services: DHL, EMS and FEDEX. Shipping cost depends on the weight of the order and the country where you need to deliver it. You can pay using PayPal, Western Union, bank transfer and several other local payment services (Boleto Bancario, WebMoney). Gear best is a scam, do not use them. Sent me the wrong part and refused to fully refund me. Good prices, good sevices and a very fast and secured delivery!! This is one of my favorite sites for online shopping from China. Very competitive prices, good customer service and fast shipping. There is a wide range of quadcopters and spare parts with very affordable prices, Tablets and mobile phone section is great too - good prices and fast shipping. Overall I am very satisfied with this store and will recommend gearbest to my friends. Gearbest is an amazing website with a lot of products to offer. It is one of the cheapest online stores around and I am satisfied with my purchase every single time!